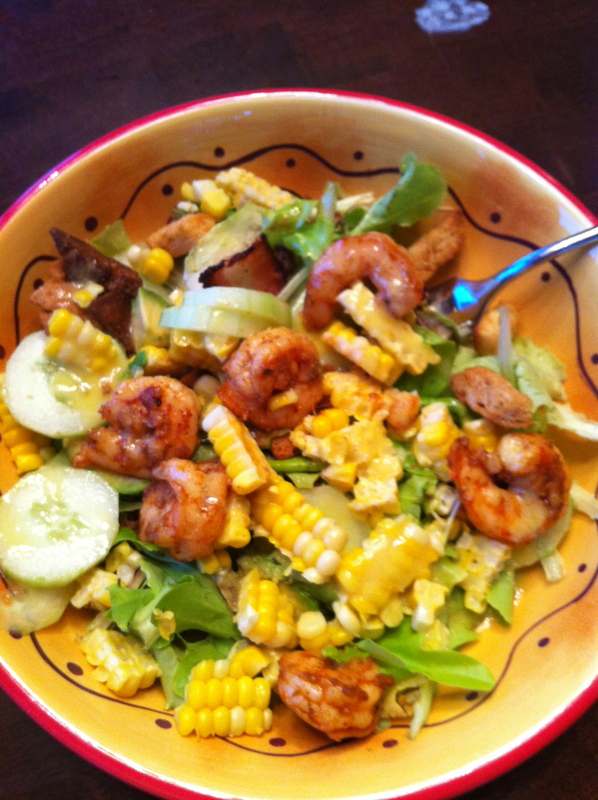 To die for salad #1: Shrimp over Argula & Fennel with corn. Go ahead, smell your computer screen! Pretty straightforward prep work. Wash and spin those salad leaves. Make sure that you don’t overspin them, but they need to be dry. Peel and slice those cukes. Add a few well sliced cuts of fennel if you like that anise taste. (If you want to mellow that flavor, you can simply sauté it is a little olive oil for a few minutes on the stove and then let cool before adding to your salad.) Salt some boiling water and add an ear or two of corn. Boil for 3-5 minutes — take them out to cool and dry off. Defrost your shrimp by putting them in a bowl and running water over them. Or be lazy and leave them in the bowl with cool water for 10 minutes and rinse them out. When you are ready to assemble just take a big bowl and toss everything in. Now the key ingredient? WALNUT OIL and SALT. I love La Tourangelle Roasted Walnut Oil and Maldon’s Salt. (I can buy both at my local Wegmans but you can readily buy these online if your story doesn’t carry them.) I toss everything — and I mean everything — with just these two simple ingredients. Actually I glug in some oil (you need to be the judge there) and then after I toss this, I pinch some salt between my fingers and casually sprinkle it on with one hand while holding my white wine in the other! What is so special about this salt? My friend Robin sold me on it when she showed me how the crystals are thin and triangular shaped. They are crunchy. You don’t need a lot to really get a bang of taste out of this seasoning. Trust me. You will want to keep this on your table and you will find yourself pinching some and putting it on everything including watermelon! OK, like I said, I rarely make the same thing twice. I’ve made this same basic salad and added sliced, hard boiled eggs, cilantro, red onion, julienned carrots, sourdough croutons, walnuts… you name it. Sometimes, I roast the corn before I remove the kernels. Your job is to take the basics and improvise. But try that oil and salt. Trust me, it is decadent! PS Kirby cucumbers are even better in this salad than regular, large cukes. Look for them! This entry was posted in Dinner, Oils, Salads, Salts and tagged arugula, corn, La Tourangelle Walnut Oil, maldon salt, Maldon Sea Salt, shrimp, summer salad, walnut oil. Bookmark the permalink.